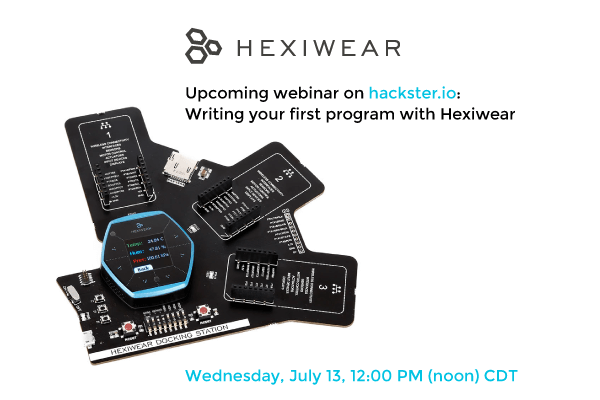 Register for the final Hexiwear webinar on Hackster.io starting on Wednesday, July 13, 12:00 PM CDT. It’s the most specific webinar of all of them – “Writing your first program with Hexiwear“. Hexiwear is the complete design ecosystem and it comes supported with open source embedded software. You can edit or write your own embedded software using Kinetis Design Studio, a free Integrated Development Environment (IDE) supported by Hexiwear and NXP Kinetis MCUs. In this webinar, we learn about the current embedded firmware of Hexiwear and write our first program using Kinetis Design Studio. If you missed all the previous Hexiwear webinars, you can get the recordings on the Hexiwear hacster.io contest page. For all prospective participants, be aware that July 15 is the deadline to apply for free Hexiwaers (hackster.io is in charge of the giveaway). The projet submission closing date is on August 29, which is 49 days from now. So far there are 757 participants and 252 project ideas. Add your own to the bunch, and you might win a DJI Phantom 3 drone!